President Donald Trump issued an executive order Monday blocking Broadcom’s takeover of Qualcomm. Broadcom is incorporated in Singapore, and Qualcomm is based in San Diego. President Donald Trump on Monday blocked a Singapore-based company’s plans to acquire the US chipmaker Qualcomm for $US117 billion, citing national security concerns. The order effectively squelches what would have been the largest technology acquisition of all time. US presidents have rarely taken such measures, and the executive order highlights growing economic tensions between the US and the rest of the world as Trump pursues protectionist policies. And it underscores the country’s growing fears of cyberwar and espionage from foreign powers. Broadcom, a chipmaker incorporated in Singapore, was looking to take over Qualcomm, its San Diego-based rival. The deal was under scrutiny by a national security panel called the Committee on Foreign Investment in the United States, which advises Trump. “While Broadcom could look to challenge this move in theory, the Trump edict essentially kills any chances of this deal happening,” the GBH Insights analyst Dan Ives wrote in a note to clients on Monday. CFIUS was concerned with what has been described as a hostile takeover of Qualcomm, which Broadcom has pursued repeatedly. This time, Broadcom claimed power with an attempt to take over Qualcomm’s 11-member board with six of its own nominees. That drama was set to come to a head at a Qualcomm shareholder meeting in March – a meeting that was delayed by 30 days, to April 5, at the request of CFIUS. That meeting has since been rescheduled again to March 23 in response to Trump’s executive order. Broadcom attempted to assuage the panel’s concerns by agreeing to move its headquarters to the US from Singapore. On Monday, before Trump’s order, Broadcom announced that it would redomicile to the US by April 3. The plan to redomicile was first made public in November, according to Broadcom’s statement. On Monday evening, Broadcom issued a statement that said it is reviewing Trump’s order. “Broadcom strongly disagrees that its proposed acquisition of Qualcomm raises any national security concerns,” it said in the statement. Though Broadcom gave up some ground to CFIUS, it played hardball with Qualcomm. The company lowered its offer to $US117 from $US121 billion at the end of February as a way of penalising Qualcomm board members who attempted to prevent an acquisition with what’s known as a “poison pill” approach, according to Business Insider’s Julie Bort. 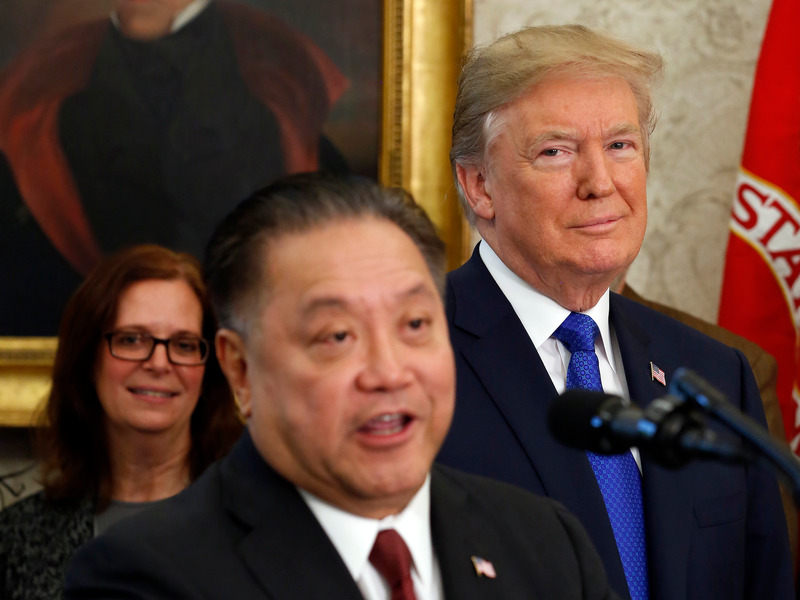 Martin H. Simon/Getty ImagesPresident Donald Trump with Broadcom CEO Hock Tan, who in November was announcing the repatriation of his company’s headquarters to the US from Singapore. Qualcomm is acquiring a rival chipmaker called NXP. The deal is awaiting regulatory approval in China and would fall apart only in the unlikely event that not enough shareholders wanted to sell. To secure shareholder support, Qualcomm increased its offer to NXP, making the deal more likely to pass. Broadcom believes Qualcomm is overpaying for NXP and lowered its price to penalise the board and convince shareholders that it was willing to walk away from its offer to acquire Qualcomm. Qualcomm’s board, however, wants Broadcom to walk away so it can stay an independent company. But all that is incidental, thanks to the intercession of Trump. For all intents and purposes, the deal is now dead. “The clear ramifications from tonight’s move are negative for Qualcomm as with M&A prospects off the table for the now the stock could tread water in the $US60 range until the company can show on a standalone basis this fundamental recovery story can play out in 2018 and beyond,” Ives of GBH Insights wrote in the note. Qualcomm shares were down 4.3% in after-hours trading on Monday; Broadcom shares were up roughly 0.5%. The Trump administration has previously blocked China-related deals, including the sale of Lattice Semiconductor to an investment group and the acquisition of MoneyGram by an Alibaba-affiliated company. (b) Provisions of law, other than section 721 and the International Emergency Economic Powers Act (50 U.S.C. 1701et seq. ), do not, in my judgment, provide adequate and appropriate authority for me to protect the national security in this matter. (j) The Attorney General is authorised to take any steps necessary to enforce this order.